Personalized Collapsible and Foldable Bottles Custom Printed in Bulk. Promotional, Inexpensive. Budget Prices in America. 12 oz. and 28 oz. Collapses flat when empty. Carablner included, BPA free. Wholesale Personalized Collapsible and Foldable Sport Bottles wiyth leak-resistant push-pull lidd and carabiner. Availasble in 2 sizes: 12 oz. and 28 oz. We also supply blank (not custom imprinted) bulk Collapsible Bottles at EQP (End Quantity Price). 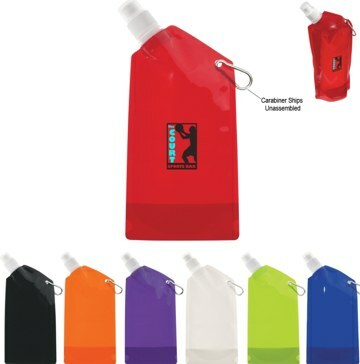 Lowest cost in USA and Canada for promotional foldable bottles. American clients pay no taxes.